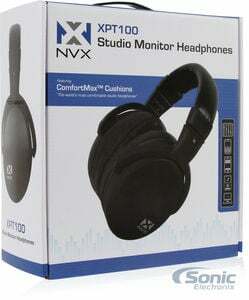 The XPT100 over-ear studio monitoring headphones by NVX are unparalleled in plush comfort and crisp sound quality. They feature ComfortMax Ear Cushions which provide outstanding comfort with their over-sized, genuine protein leather construction. 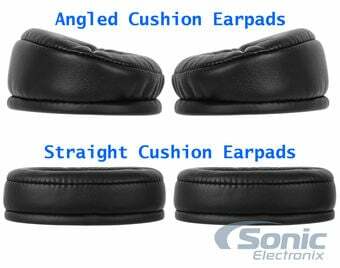 One angled and one flat pair of earpads are included, giving you the ability to customize the fitment to your preference. The large 42mm neodymium drivers maintain even tonality and deliver your music accurately without unwanted coloration. 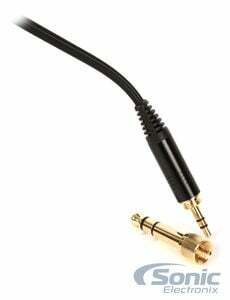 The included 1/4" stereo adapter makes them ideal for any number of musical applications. These headphones have an enclosed ear design which isolates outside noise, reducing interference and creating a quiet listening environment. A convenient carrying case maximizes portability and allows you to safely take the XPT100's on-the-go. 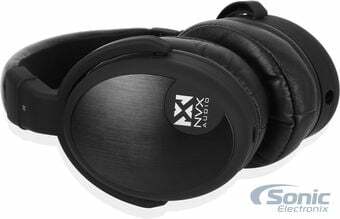 If you're looking for a pair of headphones that will give you the most bang for your buck, then look no further than the XPT100 by NVX! 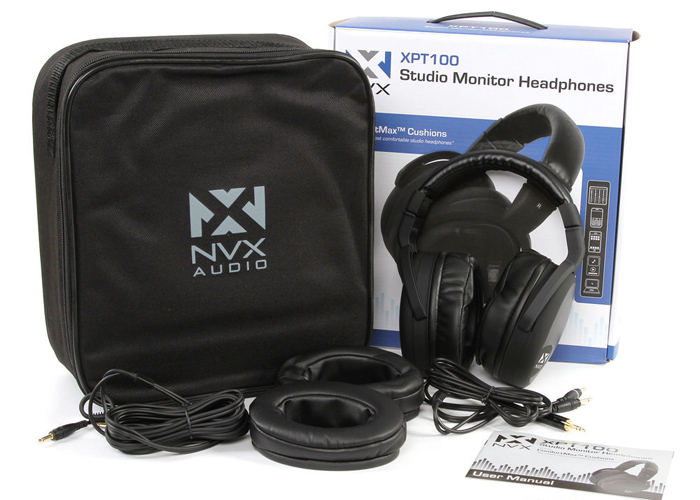 Check out Head-fi.org's no-holds-barred review of the XPT100 here! ComfortMax® earpads are made with plush protein leather and are over-stuffed to provide superior comfort for long listening sessions. 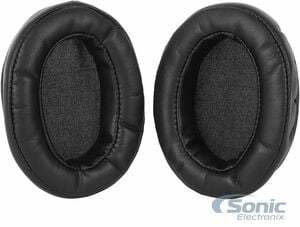 Included is a set of straight earpads which are ideal for anyone who wants a more traditional fit, and a set of angled earpads which give you a fit more contoured to the shape of the head; many listeners have found the angled design to be even more comfortable than the flat. Simply twist off the earpads to interchange them in a matter of seconds and you're ready to enjoy any musical activity! The ultra-flexible headband makes the XPT100 very versatile and ideal for various activities. 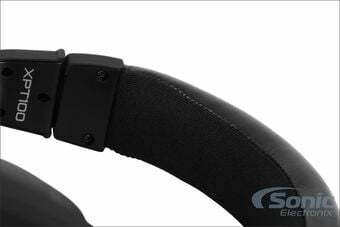 The flexible design consists of a metal headband and high quality protein leather. The adjustable headband has a wide range of motion which means users with any sized head will be able to enjoy perfect fitment that is right for them. 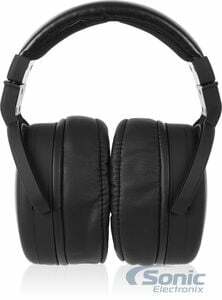 These headphones are great for studio engineers and masters that have to frequently take their headphones on and off when mixing. Replaceable parts for long service life. The headband, earcups, earpads, and cord are all easily replaceable for years to come! Ideal for any device with a headphone jack! This means that the headphones or earbuds have a built-in microphone. This can be a microphone on the cord, built into the headphone, or even a boom microphone. These mics can be used for music devices like iPods, for Smartphones to make and receive calls, or for gaming purposes. The type of connection the headphones use to connect to receive the audio signal from a music source. Traditional headphones use an analog 3.5mm headphone jack. Newer technology has allowed digital signals to be sent directly to the headphone using an Apple Lightning or USB-C cable. The Jack Angle refers to the angle of the input jack on the headphone cable. Straight Jack: Straight plug with no angle. Angled Jack: Angled plug, usually a 90 degree angle. Swivel Jack: A swivel jack is able to swivel between a straight plug and an angled plug. Refers to the connection adapters included with the headphones like 3.5mm or 1/4" input adapter as well as airplane adapters that let you use your headphones with airplane specific headphone jacks. Refers to whether the cable can detach from the headphones. If a pair of headphones has a detachable cable, the cable can be replaced with a longer cable, one with (or without) a microphone or if you accidentally damage the cable. This refers to the level of water resistance of the fitness tracker. Some fitness trackers are water resistant and can be used while swimming, while others are only splash proof or should not be used near the water. Refers to whether a pair of headphones can be folded up. These headphones feature hinges in the frame above the earcups that allow the headphones to neatly fold into a much more manageable size. Folding headphones are perfect for anyone who spends a lot of time traveling and needs a compact pair of headphones that can fit in their bags. Great and comfortable pair of headphones! By no means am I an audiophile, but I feel I can still appreciate the sound of some good 'phones. The NVX's are extremely comfortable to wear, even for long periods of time and with eyeglasses (I'm an all-day wearing of my specs so this was important!). My ears never feel sweaty or like my skull is weighed down while they're on. They're actually a pleasure to wear! They feel sturdy so far, but I'm not rough on any of my possessions so I can't speak for how well they'll stand up to drops and such. They're bulky though and not exactly the greatest things to wear around in public. The XPTs are large and noticeable from far off, but if you're okay with that these babies are more than worth that small shortcoming. As far as sound goes, they seem very balanced to me. No single tone seems to outshine the other at any point; the bass is warm but not loud, vocals shine but aren't overpowering, and you can definitely hear every instrument in a song without any of them feeling muddied or muffled by another. The bass is clear in rap songs where it's needed and invisible in songs where it's not, which is another huge point for them. In all I love these headphones and feel like I couldn't have made a better choice in buying them. These headphones are flat out amazing. They firmly, yet comfortably, cup your ears so you are isolated in the experience. They are soft and will not make your ears over heat. The large 42mm neodymium drivers deliver the 10hz-26khz sound and expose parts of songs I had never heard before. I thoroughly enjoy my music, or I can really work in these to deliver an accurate mix to a client in whatever environment I am mixing in. With the warranty and all the extras they come with you would really be doing yourself a disservice to not at least take a listen. I'm buying a second set. NVX, what else do I need to say? Good sounding head phones. Best reference headphones under $150. Period. These make the legendary-status Creative Aurvana Live! ($60 to $80) sound bad. That said, there is no headphone currently near this price that will deliver the same neutrality, accuracy, control, or comfort that the XPT100s do. I could do an extensive comparison between these and the other sets of headphones I own (CAL!, ATH-M50, Panasonic HTF600, Marley EM-JH020-MI, I could go on), but I won't because there is simply nothing to compare. These win in every aspect except for portability. The cheapest headphone that compares to the NVX XPT100 is the $170 Sennheiser HD25-II 1. If you are looking for at-home listening cans, buy these now. You needn't spend any more time reading reviews, finding comparisons, or doing any other kind of research. Very soft and very comfortable cushion. It gives no pain/stress in my ears. What I don't like about this headphone is the build, the headband is so flexible. 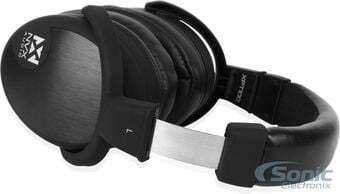 Simply put the NVX XPT100 are, in my opinion, the headphone to purchase in the ~$100 range. They provide a sound that's compared to headphones 3 times it's price while severely outclassing every closed headphone in it's price range, again in my opinion. As a complete package the XPT100 are astonishing headphones, the inclusion of angled pads and a second set of cables is icing on the cake. If you have any concerns about the quality of these, please drop them at the door and order a pair if you want a balanced closed headphone at an excellent price. Great headphones , good construction and terrific sound. nvx did not let me down on this product.I am extremely pleased with this product and would recommend these to friends and family.These are by far the most comfortable headphones I have ever used.I got these in a package deal with the nvx earbuds and while I was unimpressed with the earbuds the headphones made it all good for me. I've been using in-ear headphones for a long time and I wasn't sure about over-ear headphones. But with XPT100 you'll get a great sound for the money and it's so comfortable you'll want to keep them on your ears even when you're not listening. 1. Comfort - You will not forget that you have them on but the padding is very generous and does not put pressure on your ears in any spots. Though due to their size they are not suitable for outdoor use unless you do not care how you look. At home - very comfy. 2. Large ear cups - I like when headphones do not touch my ears and they are perfect in this area. 3. Sound - Very natural sounding and easy to listen to. There are no harsh highs or booming lows. Soundstage is somewhat lacking but that can be expected from a closed headphones. Overall you can listen to them for hours without fatigue. 4. Isolation - They isolate very well. I guess that's due to the large ear cups and extra padding. 5. Short cable (in an addition to a long cable) - Good when your main use is laptop or mp3 player so you do not have to trip over extra feet of cable. So far I have no dislikes. I haven't rated durability as I own them only for a few weeks. So far they have held up pretty well. NOTE: I put 3 out of 5 (middle) just because I can't submit no rating. I would highly recommend them if you want good home headphones on a limited budget. These are amazing! 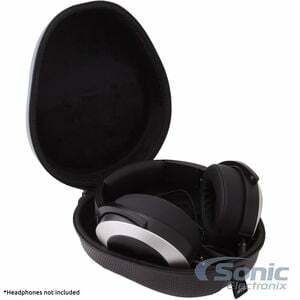 They are very comfortable, have incredible sound quality, and have a slick design. Also, extreme quality of these headphone insure me they'll never wear out -- like so many other brands. I love them! They are more then comfortable. The clamp is light and the cushions feel like leather pillows wrapped around your ears. I really like the appearance of them, totally my style with that dark brushed look. Some have complained about the super flexy headband, but I actually like it. Some have also complained about the big carrying case, but I actually like that too; I throw it in my gym bag with everything else on a daily basis for work and I know they're safe. I guess my ONLY complaint, and a small one at that, is that on devices that don't output allot of power will make you wanting the volume louder when already maxed out. But, I will probably be getting a portable amp/dac combo for that. also, the extra angled ear pads i found nice when laying down, because you can tilt the headphones foward and still have a proper fit. as for the sound: clear and clean. these are very nuetral headphones, which makes them very versitile. youtube/netflix is great due to this. also, i am a little sensative to high treble, and these headphones let me listen without discomfort. it's exactly what i wanted, nuetral sound with easy-to-listen treble, and clean bass ( i don't listen to rap or anything, and i don't like over-done, muddy deep bass ) and extremely comfortable. for the price, get these no questions asked. 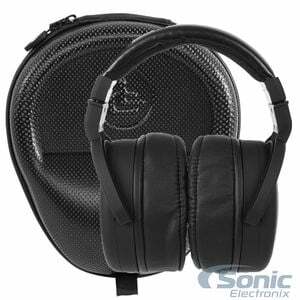 These are very good Headphones and work great with Laptop. I've been using these headphones for the past several months and they have really grown on me. I had previously been using HD280 pros and M50s for my monitoring but these have fit right in with my standard issue headphones. The angled ear pads make this more comfortable than my others so i find that i'm using them more. I'd recommend them. 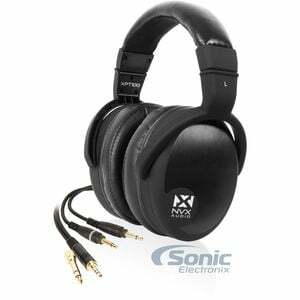 Nice and comfort over the ear headphone from NVX. Recommended product. The disadvantage - unable to rotate them. Excellent, maximum bang for your buck! These headphones are very impressive. Out of all my headphones, these are the most neutral. They have a decent soundstage that doesn't get congested. Their sound is the most versatile, doing justice to all varieties of music, faithfully. They benefit from amping, but don't need anything powerful. Unless you have a solid DAC/amp, these are superior to even the senn 650s. I've never purchased a headphone that was as worthy as these, given they're only 100 dollars. Compared to the $300 M100s, these are absolutely superior. These lack any strong coloration, which depending on what you're looking for, may sound dull at first. The construction feels a little flimsy at first, and they could be a little tighter( build wise, not fit). However the trade off is these are incredibly light, and very comfortable ( I personally prefer the default flat pads). I've also heard where 840s, Sony MDR v6, audio technical m50s, akg k240s. None of them provide such textured bass, smooth mids, and detailed treble, with such comfort and low amp requirements for $100. Lack of portability is the only limitation. Get 'em! These headphones are awesome. The sound is better than any other headphones I have every used and they are comfortable enough to wear for hours. The noise reduction is so good I can’t hear my wife yelling at me in the background. They give a whole new meaning to drowning in sound. I can't wait to use them on long plane trips. Got this one during President's Day sale and I would say it is the best bang for the buck. Sound stage is outstanding. Good all-arounder. Pads are comfy but get a little warm after an hour or two. If you want a fuller, punchier bass, you might wanna consider something else though. Great headphones. The sound is awesome. The only con is that they're not collapsible and are not good for mobile use. It has been years since I have used headphones. That being said, these sound great to me. The sound is very clear and somewhat neutral - no range (bass, mid range, treble) seems to be emphasized. They are extremely comfortable. I can also use them with my computer (or wife's iPad) without added amplification. The only drawback I see is that they are somewhat bulky - I probably won't be using them for travel, though they do come with a large travel case. The first thing my son did was to try them on with the flat pads ... then he changed it with the angled pads. He simply loves them. But it really was a great Christmas grift. 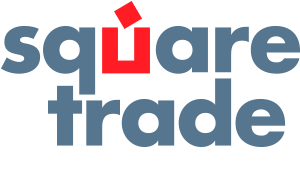 My son says they do exactly what their website says and that was the reason he chose them. Comparing these to the Sony I had before, it has a much more clearer sound response, but the bass isn't as strong as the Sony. Don't get me wrong though; these headphones can hit subsonic notes and still sound somewhat loud on the bass. I also use these headphones for music production with FL Studio. When experimenting with sounds, you can hear the slightest irregularity in uncorrected sounds to allow you to produce better sounds. Needless say if you have considered these headphones, but hesitant to get one, you won't be disappointed. I love the sound of these headphones. But the short 1.3 meter cable was bad , lucky they also came with a 3 meter cable. No replacement cable on NVX site. Found Brianwavz HM5 cable on mp4ntion.com for $9.50 free shipping. from Hong Kong. Received the new cable in 15 days. Works great. I do not think anyone could go wrong with buying these, I listen to them for hours at a time with zero problems. I remember buying headphones for $50 back in the 80s (a lot for me then) that did not sound this good. $80 was a bargain and with the $5 refund for the bad cable, just cake. Have you been sent to the couch lately? these should be there for those times when some light shines through and others when they are just as miserable as you can be.. don't have a best or worst thing to say, they are sometimes source dependent Amp/Dac or not, they have presence for sure.. are boxy sounding at times and suprisingly open in some cases. I would go ahead and pick'em up for the price jjust because you know your going to do something wrong.. these are right enough! 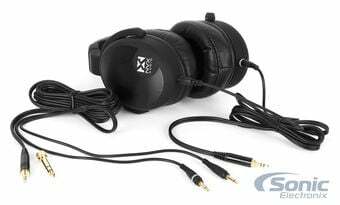 The XPT-100 are great value headphones for the price. Comfortable fit, noise cancelling, good base and tone. They are sturdy and the ability to purchase replacement headbands is very handy. These headphones are awesome, very clean and balanced sound when listening to anything from music to movies. Easily the best sound experience I’ve had with a pair of headphones, and also really comfortable. They do a good job of blocking ambient sound, too, so you can get really immersed in what you're listening to. Not going to say they are the best. Ive heard different things on reviews. They are infact uncomfortable to wear with regular glasses. They did infact make my ears sweat. Sound quality is great. Once burnt in the sound is beautifully full and clear... The instruments are separated, and once i increased slightly bass frequency the headphones become the ultimate listening experience for anywhere close price range. The cushions are super comfy and I can wear them for a super long periods of time. I was skeptical/hesitant to get these because I had some top of the line Able Planet active noise canceling headphones that were double the price, but I've heard a lot so I decided to bite since my Able Planets were falling apart after years of use. The NVX cans sound great -- better than my dated Able Planets now compared side by side -- and the build quality seems similar. Don't even need the active noise canceling because the ear cups fit snugly and nicely and the sound is so full. Note that the black marked cable is for the left phone, and the grey marked cable is for the right. These are some of the best headphones you can get in the price range, especially if you're looking for something neutral. Would I pay MSRP? Yes... the cost on sonic make them even more of a steal, i'm wondering why i didn't buy them sooner, I am just completely lost in my music, the bass is good, the trebles are crisp, and everything is where it should be. They are on the larger end of the spectrum given its size, but the large size means comfort, right? in this case, yes, these are the most comfortable headphones you'll wear ever. I've worn turtle beach, bose, and beats audio headphones (beats audio is horrible). These are better at comfort and sound in both turtle beach and bose, and it's no competition when compared to beats audio. There are some great features on these headphones found only on other higher end sets that cost 3 or 4 times what these cost, like removable cables, a custom case, different style drop in ear muffs, and made of completely of metal. Never have i heard music as good as this, and never will you hear music as good as this. - Ease of use I am only giving a 4, the jacks that attach to the cans aren't letter labeled, so i had to go into the manual to find that grey is left and black is right. it also takes a bit of force to get them to pop in, this should become easier with time. Very comfortable and great quality of sound. Would recommend to friend. Good sound, extremely comfortable, I like the two cables in each ear rather than just one, I use it with a Zalman mic and it's incredible. The sound is very, very decent. If you are like me you found theae from doing research on the most comfortable headphones for the price. They did not disappoint. Smart buy. I own a ton of headphones. Opening the box of XPT100 makes me feel like I got a lot for my money. Definitely nice to see ton of goodies in the box. An extra set of pads is something I appreciate a lot. Headphone fits my relatively big head comfortably. As a comparision DT880 premium doesn't fit my head as easily as these. Sound is neutral. I still haven't listened to these extensively. So I might come back later to update this review. Given all of the reviews I read on the NVX Audi XPT100 headhones and how so many people thought they were amazing, I was thoroughly disappointed. 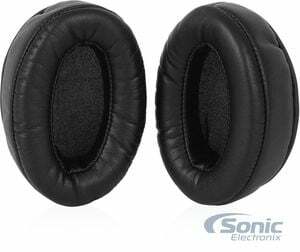 I was buying these to replace my Sony MDR-XB500 headphones as they're getting old and starting to wear out (I've had them for about 5 years now). After switching back and forth between the XB500s and the XPT100s, listening to the same part of the same song and keeping the volume exactly the same, the XB500s are better. Between my father and I, we have around $50-60,000 worth of home audio equipment (surround sound, vacuum tube amplifiers, high-end this, high-end that and so on). I wouldn't quite go as far as to call myself an audiophile, but I am really picky when it comes to my headphones, and the XPT100s didn't quite reach my standards. I'm not saying they're bad headphones, I'm just saying the XB500s perform better for what I like. 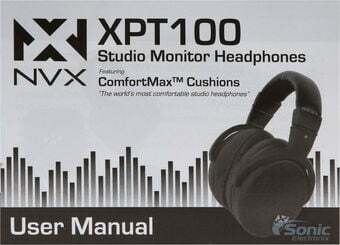 For lows, the XPT100s are rated to 10Hz whereas the XB500s are rated to 4Hz. Granted, average human hearing is only down to about 20Hz or so, but as the frequencies drop below 30Hz, the XPT100s fizzle out and stop producing low frequencies while the XB500s power straight through and rattle your entire head. For volume output, the XPT100s aren't quite as efficient as the XB500s. Keeping the volume the same on my laptop/headphone amp, and the XB500s produce more sound on the same power. And as I increased the power higher and higher, the XPT100s began to distort much sooner than the XB500s did. 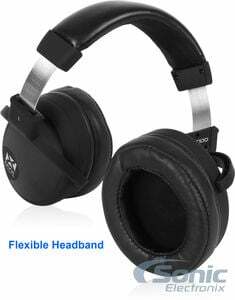 Also, everyone raved about how comfortable the XPT100s were, but (again, in my opinion and what I've been using for the past 5 years), compared to the XB500s, the XPT100s felt cheap, with minimal cushion on the ear cups. 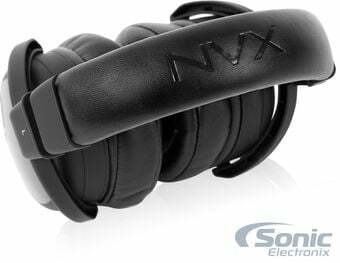 All in all, they are decent headphones, but compared to what I've been used to for the past 5 years, the NVX Audio XPT100s are no match for the Sony MDR XB500s. 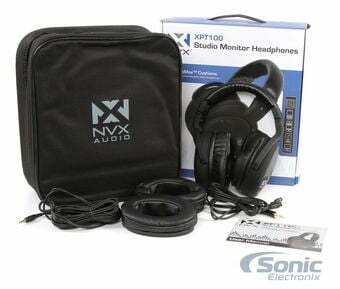 View all available accessories for the NVX Audio XPT100.